Research performed by Drs. David Roye and Michael Vitale as a part of the Children’s Spine Foundation has led the study of quality of life for patients with early onset scoliosis. The questionnaire developed by the team at Morgan Stanley Children’s Hospital of New York-Presbyterian is now used at 29 institutions around the world. Since 2006, Drs. 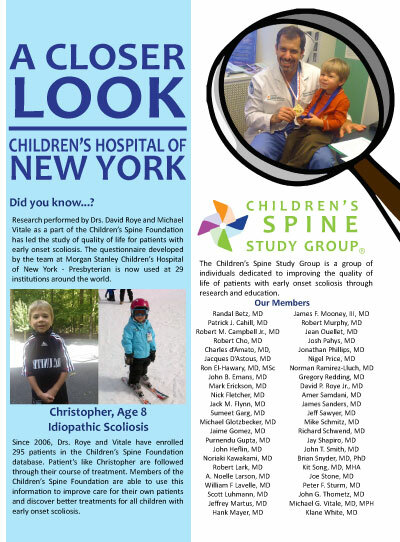 Roye and Vitale have enrolled 295 patients in the Children’s Spine Foundation database. Patients are followed through their course of treatment. Members of the Children’s Spine Foundation are able to use this information to improve care for their own patients and discover better treatments for all children with early onset scoliosis.